Ala prima painting is painting "all at once", or the process of painting wet into wet. 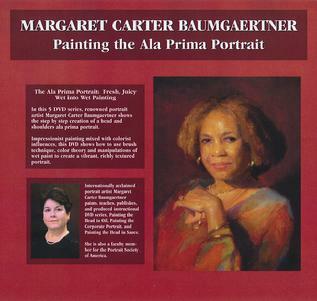 Ala prima portraits are fresh, lively, energetic and intoxicating to the eye. During this 4.5 hour, five DVD series, Baumgaertner will demonstrate wet-into-wet painting as she captures model Peggy Moore (portrait on DVD cover, right). The series follows the step-by-step creation of the head and hands ala prima portrait, from setting up and posing the model, drawing, lit and shadow, value massing, color correction, placing features, correcting and finishing. The DVD series also includes chapters on manipulation of wet paint, brush technique and color theory. The introductory price for this new series is $189, retail price is $259. Shipping and handling is $15 for orders in the US and $20 for international orders. You can order this series online, below, or call us at 608-788-6465 to place this order with Visa or Master Card. If you have any questions you can write us at baumportrait@cs.com. We also accept checks written to Baumgaertner Portraits and mailed to 621 S 28th St, La Crosse, WI, 54601, USA. Please specify what items you are ordering if sending by mail and remember to include shipping and handling costs ($15 domestic and $20 international). 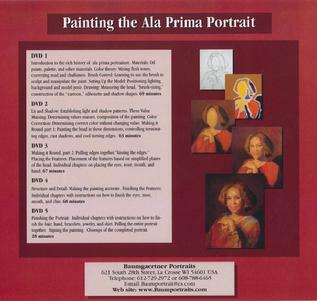 Introduction to the rich history of ala prima portraiture. Materials: Oil paints, palette, and other materials. Color Theory: Mixing flesh tones, correcting mud and chalkiness. Brush Control: Learning to use the brush to sculpt and manipulate the paint. Setting Up the Model: Positioning lighting, background and model pose. Drawing: Measuring the head, brush-sizing, construcion of the "cartoon", silhouette and shadow shapes. 69 minutes.